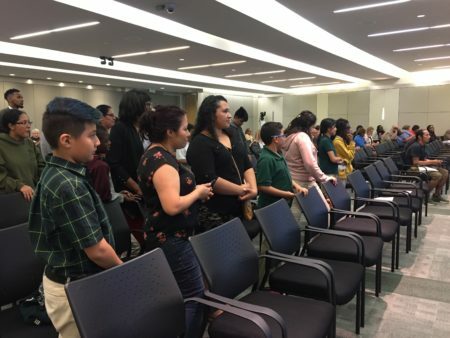 Last October, the Houston school board opened its regular, monthly meeting with the typical routines — the pledge of allegiance, recognitions — and then moved to the district’s business. 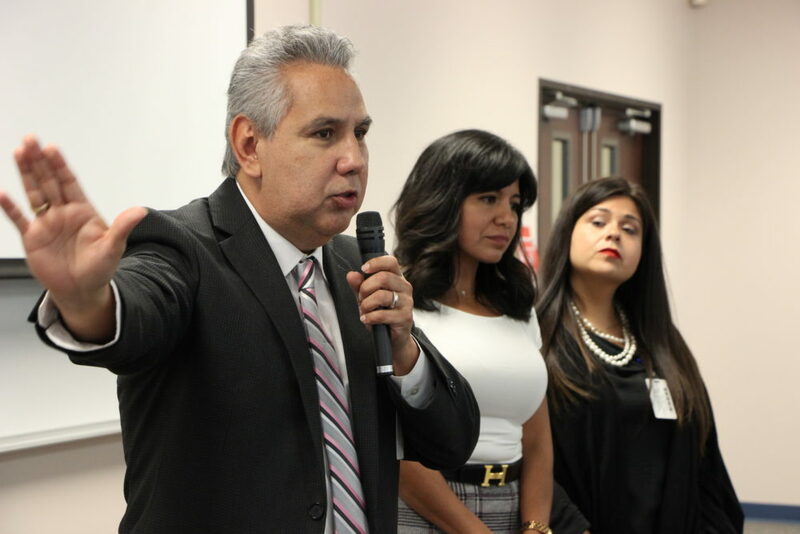 That October meeting turned controversial when school board member Diana Dávila made a surprise motion to fire the district’s interim leader Grenita Lathan and hire a new one, Abe Saavedra, who served as HISD superintendent in the early 2000s. The move shocked many people in the audience and some other board members, including Trustee Wanda Adams. “I did not know about this at all. A couple of my other colleagues did not know about this,” Adams said. 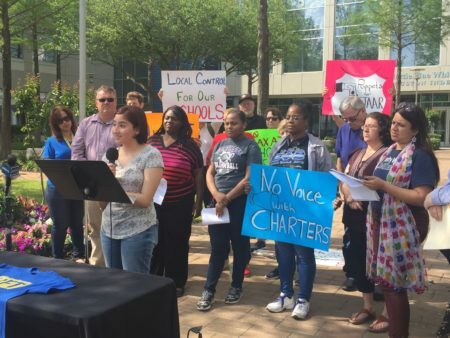 “Again, it goes to my original statement about racism on this board,” she said, referring to the fact that the Hispanic board members wanted to oust a black superintendent for a Hispanic one. Ultimately, the Houston school board voted 5-4 along racial lines to fire Lathan and hire Saavedra. They reversed course a few days later at a press conference. But now, administrators at the Texas Education Agency are examining what was behind that surprise motion and split vote. 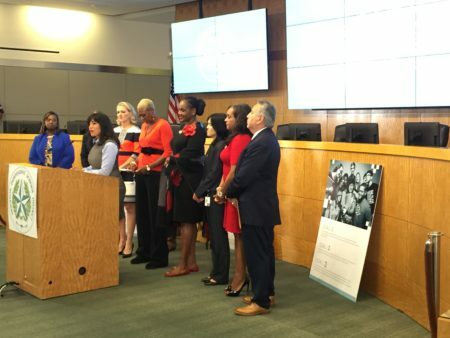 In particular, they are trying to determine if some Houston school board members violated the Texas Open Meetings Act and if there are any other governance issues. 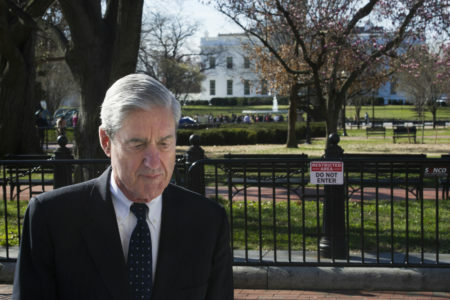 “There’s strong evidence that this was your classic ‘walking quorum,’ where one trustee carries water to another trustee,” said Joe Larsen, a Houston attorney who serves on the board of directors for the Freedom of Information Foundation of Texas. Larsen said Texas has an open meetings law to protect against corruption and require transparency. That’s why it’s illegal for elected officials to talk about business without a majority of members present or notifying the public ahead of time. A ‘walking quorum’ is when elected leaders have meetings in person, on the phone or online without a quorum — often a majority — to talk about public business. To some, the timing of this new, state investigation may seem political — it came just weeks after Gov. Greg Abbott tweeted that the Houston school board is a disaster and should be taken over. But elected officials on both sides of the aisle say it’s needed. “The TEA investigation is absolutely warranted by any measurement that I can understand,” said state Sen. Paul Bettencourt, R-Houston. He said that he called the state agency to say he was concerned. The Houston Republican also plans to file a bill this legislative session to change how Houston school board members are elected. Bettencourt’s not the only one who complained. So did Houston school board member Jolanda Jones. She said that she believes potential violations started months ago when the budget unexpectedly failed to pass in June. “Most of us thought it was going to pass. Everyone said they were cool with it and then all of a sudden five of them said no — which confused everybody. So that’s when I believe it started,” Jones said, speaking to reporters at HISD headquarters. Jones said that she wants an investigation, but she’s also worried about the fallout. If state investigators find substantial evidence, they could recommend that the entire board be replaced with outside managers. “I’m just very frustrated because at the end of the day, if we get taken over, the kids are the ones that are going to suffer — because grownups have been behaving badly,” Jones said. The threat of a state takeover has already loomed over the state’s largest school district for over a year, because several schools have performed poorly on state tests for years. But now elected trustees could be replaced for an entirely different reason. Still, others believe that won’t happen. Dávila, the trustee who made the original controversial motion and who was recently elected board president, told News 88.7 that she’s confident the Houston school district will keep its accreditation after the investigation. News 88.7 producer Eric Stone contributed to this report.